For the majority of people, “light” means little more than illumination. As soon as technology allowed it, relying on artificial forms of light to prolong the waking day became second nature to humankind. In recent years, increased interest and extensive research into light and its properties brought awareness that the quality of light has direct effect on our health. Prolonged exposure to low-quality light throws off hormone secretion, upsets circadian rhythm and can lead to permanent damage to eyesight, among other undesirable consequences. And yet, about 90% of the world’s population spend most of their time under flicker-heavy, low-quality artificial lighting. We intend to change that. 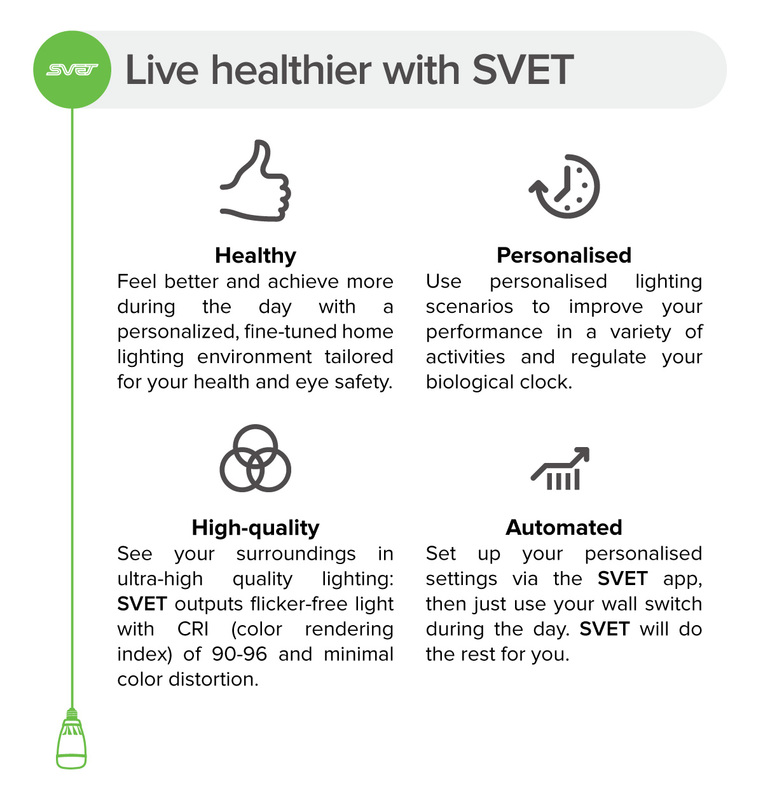 By supporting our project and becoming an early adopter, you will help make SVET a reality and contribute to the proliferation of health-centric lighting technology (not to mention improve your quality of life). From the first sun rays in the morning until the last moments of dusk, the sun’s light is never the same, constantly changing in color temperature and brightness. Our bodies are rigged to synchronize with this daily rhythm, changing the activity of all the organs based on the data received from the light. Artificial light is unable to provide such data, so spending some time away from the sunlight inevitably leads to upset circadian rhythms, with many body systems working without proper rest or sufficient energy. SVET light bulbs completely mimic the dynamics of the sunlight, which allows your body to function the way it should. It will help restart your body’s self-regulating mechanisms, improve your general physical and mental state, make you more energised and reduce stress build-up. Due to our human nature, any light is a signal for our body to stay awake. Overuse of artificial lighting and other lighting sources leads our bodies astray, disrupting our sleeping patterns. It all comes from blue light. Blue light suppresses melatonin – a hormone naturally produced by the body at nighttime when it is dark. It is necessary for a proper sleep, but it is also a powerful antioxidant and has many beneficial health effects. That means the more light we are exposed to as we get ready for bed, the harder it will be to fall asleep and get a good night’s rest. Any immediate shifts from bright light to darkness can also make it harder to get to sleep. 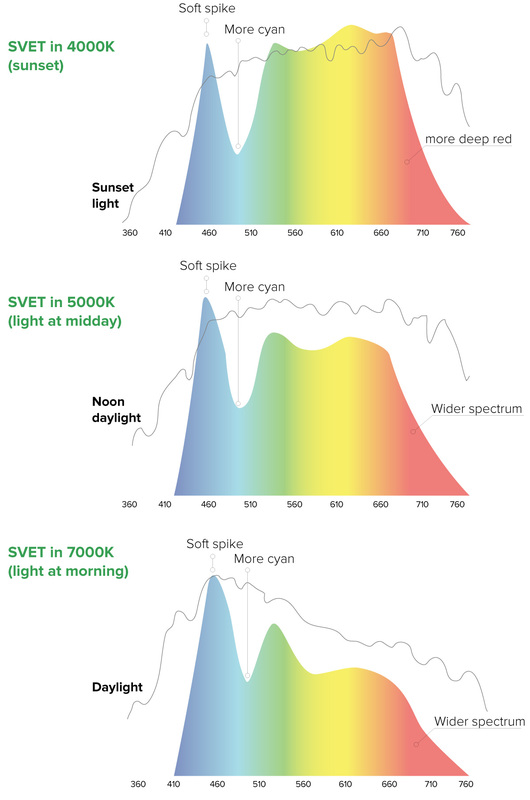 SVET decreases the blue component of the light spectrum during late evening hours prior to sleep time. It helps you fall asleep faster and have better sleep in general. We perceive light through our closed eyes during hours of sleep, and the specific properties of dawn light serve as triggers for the body to prepare us for wakeup. While we are still sleeping, the nervous system wakes up internal organs and increases brain activity by degrees. The final moments of waking up are completely stressless and occur when the whole body is prepared. The dawn lasts 16 to 30 minutes, during which the sunlight transitions from warm white to cold white via complex algorithms. Waking up in this manner provides us with good mood and good health for the morning, which is a major factor in helping us stay positive and awake through the day. In some cases, waking up with sunlight is recommended as an alternative to many types of prescription medication. SVET Dawn simulation will create veritable Dawn lighting in your room, providing you with a completely stressless, and healthy way to wake up. Staying energized throughout the day in an urban environment can be difficult. Certain types of lighting can harm your concentration, and not every common source of light benefits your productivity. For example, cold light increases our concentration and makes us more alert, while warm light can have a relaxing effect on the body. A properly set-up cold light can get you the same effect as a cup of coffee. Of course, waking up with the sunrise and starting your workday under the morning light, you won’t need coffee. SVET light bulbs take current time of day into account and dynamically change light properties along with it, providing the right type of light at the right time – just when you need to be concentrated or relaxed. The proper lighting for reading improves text comprehension and memorization, but it is not easy to achieve. It differs by time of day and must strike a balance between stimulating and relaxing. SVET features a reading mode that will automatically tune the current lighting to create the best atmosphere for reading. On top of that, the perfect color rendering of SVET is extremely useful for reading and interacting with all kinds of media. 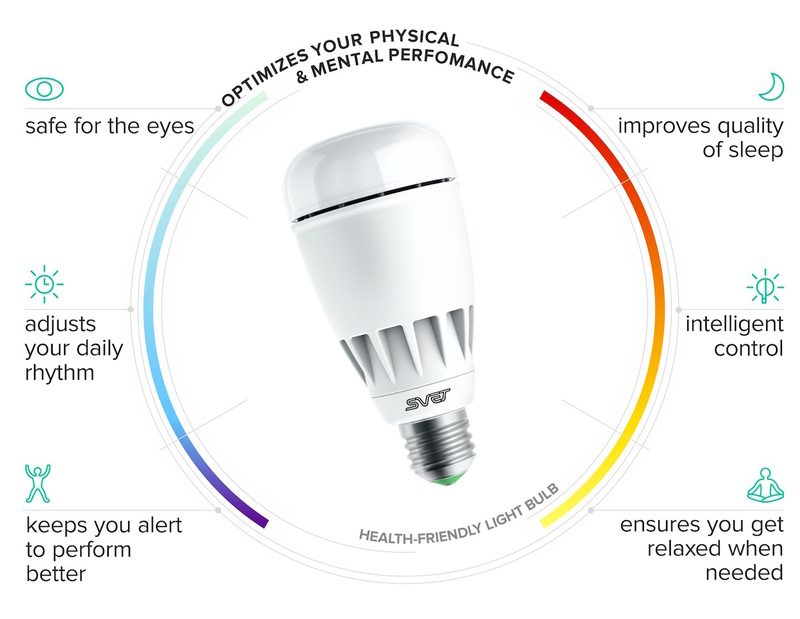 Adding the full-spectrum SVET bulbs to your daily routine is like having a personal color/chromo therapist. 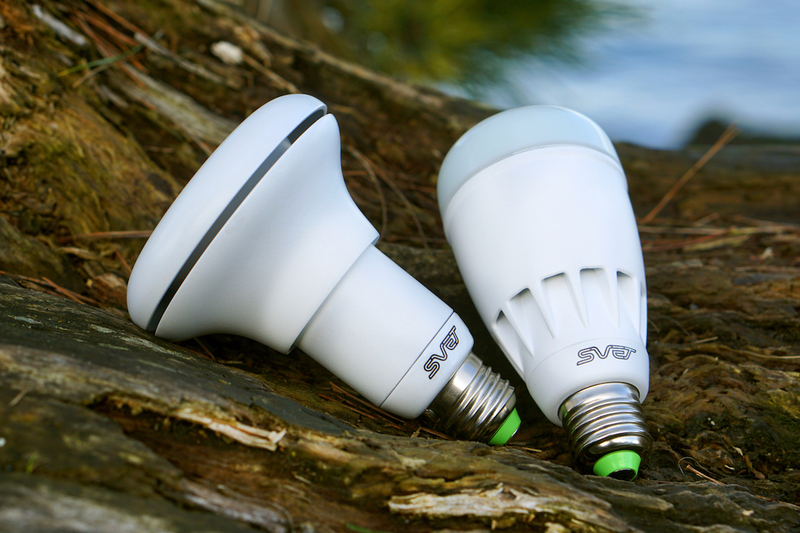 SVET light bulbs have a flicker index of less than 0.1%, meaning that SVET light is virtually without flicker. 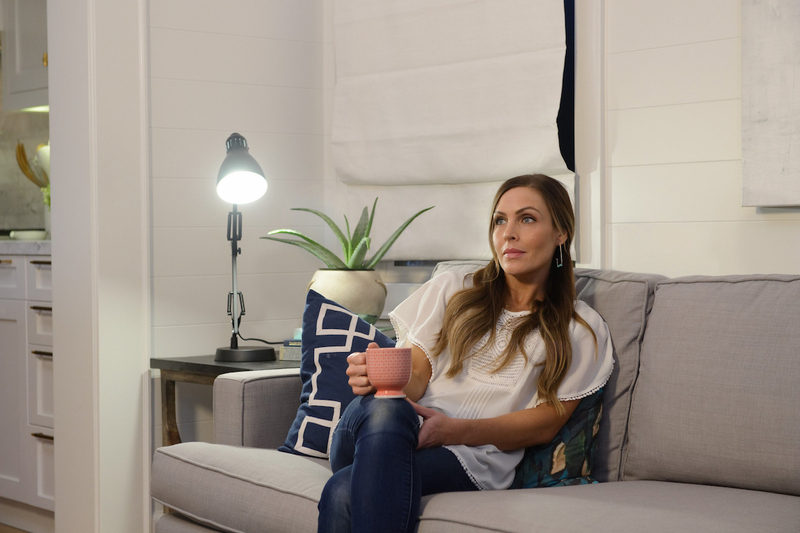 No flicker helps prevent headaches, migraines or even depression, which standard artificial lighting sources only exacerbate. Also, SVET is not dangerous for people with conditions of photosensitive epilepsy or autism (flicker-lighting can cause a person with epilispy to had severe seizures). Flickering is one of the negative effects of standard home and office lighting. It’s inherent to the majority of lighting equipment available on the market due to the fact that it shares the same power system, which is a 50/60 Hz alternating current. Some light sources come equipped with power converters that allow them to change the frequency of flickering, making it less pervasive. Still, the best choice would be to get rid of flickering completely, which is possible with analog dimmer-equipped lighting. 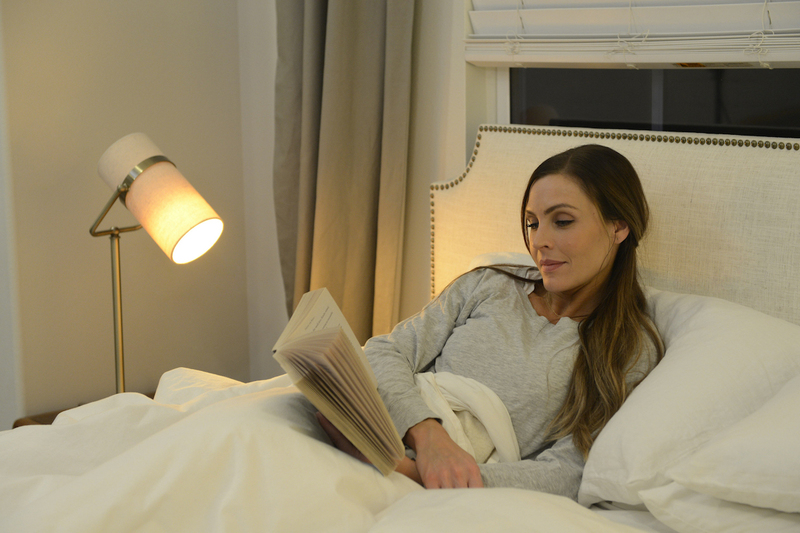 SVET uses analog dimming to avoid flickering when changing the light's brightness. The main aspects of how light influences us can be broken down into three categories: vision, emotion, and physiology. From the lighting point of view, it is important to have the maximum visual comfort to perform different tasks during the day. This includes the light source to dynamically change its color temperature and intensity. Standard household lighting solutions output light in a poor spectrum, which means that everything you see under artificial light has distorted colors. The rich-spectrum lighting of SVET allows you to see the colors of your surroundings with minimal distortions. This is very important for our vision and well-being as natural colors are more comfortable for the eyes. The effects of light on human physiology are all but completely ignored by contemporary lighting industry. With SVET, we intend to buck this trend. Our bodies naturally align to the sun's light cycle, and much like the sun, a good health-centric light source should support our circadian rhythm. 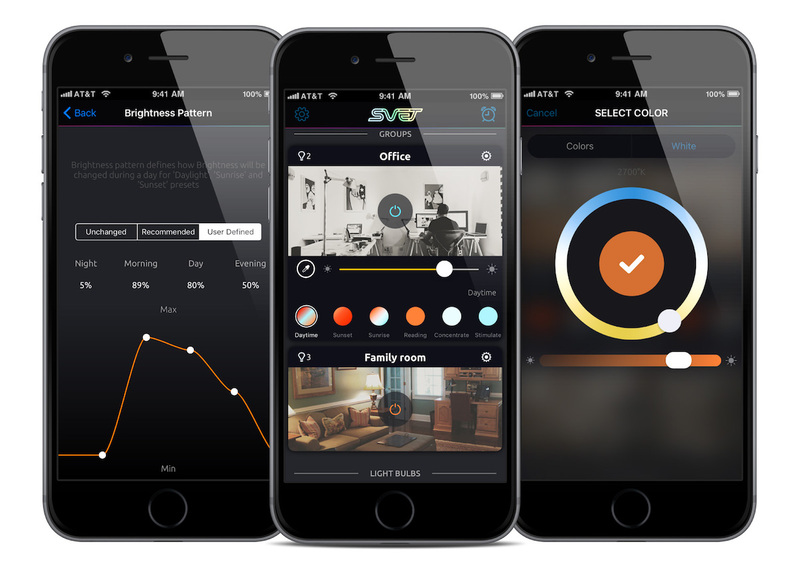 SVET can fully replicate natural light phases, from sunrise to sunset, and automatically tune the duration of each lighting period to fit your daily regimen. And a range of presets for different activities ensures you get the best lighting environment for any kind of work, fitness or leisure. The mechanical and electric design of the bulbs is made to meet the requirements of rich-spectrum, high-quality lighting solutions. The final prototypes are made with our contract manufacturer. The assembly process for mass market is fully defined, from the materials and manufacture to quality control and testing procedures. The production of the first batch of SVET light bulbs is ready to be started. 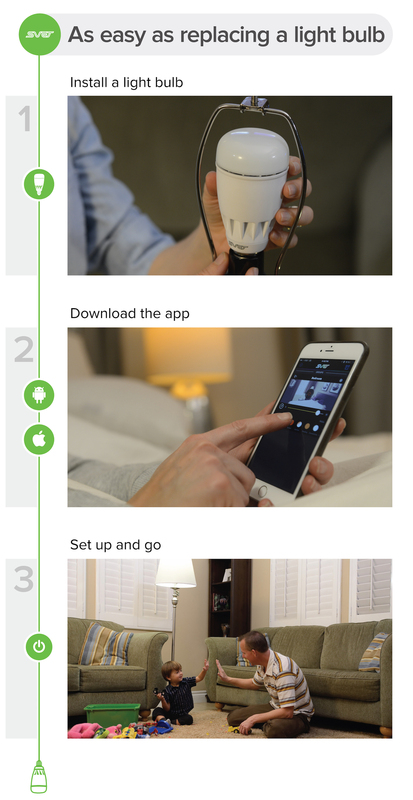 The SVET App allows you to configure individual settings for any of your SVET light bulbs. The configuration process starts with a brightness pattern. 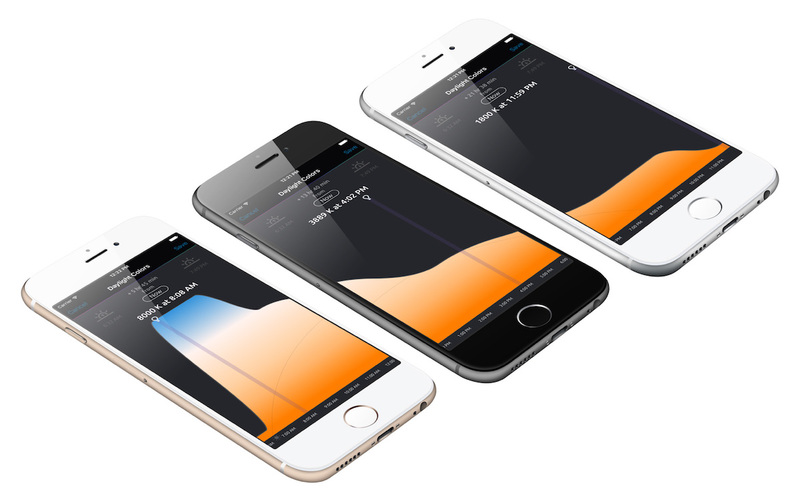 With the App, you simply set up the most comfortable level of light intensity during the daytime. From this point, SVET light bulbs are able to run a daylight compensation lighting scenario. Using the App, you can choose different modes such as Relaxation, Reading, Concentration, Energizing, and more custom settings. Selecting a new mode changes the current lighting scenario in order to receive the most suitable lighting conditions for the chosen activity. Note that our biological safety system will not allow you to choose harmful lighting configurations, like hard blue light in the evening. The purpose of the safety system is to ensure no harm can be done to the user’s circadian rhythm or eyesight. Native versions of the mobile app are available on iOS and Android devices. The App allows you to manually control each light bulb or a group of light bulbs at the same time. Using the app you can change the light’s color temperature or brightness, turn on and off, change lighting color, and many more custom settings. To get your lighting really personalized, set your wake-up and sleep time settings. You can simply set a lighting alarm clock for the next morning and the App will create a personal lighting scenario based on your wake-up time (all while taking the season into account), which will be uploaded to your light bulbs. After that, the light bulbs will be able to execute the scenario without the app or any additional connection. Just use your wall switch to turn the light on and off, and your SVET light bulbs will execute your personal scenario. The SVET team consists of 5 modest professionals who share a passion for technology, outdoor experiences, recreation and hard work. Although we come from various professional backgrounds and vary in our personal interests, we are all crazily dedicated to the quality of what we do – currently, the SVET Light Bulb. In the development of simple remote-controlled LED light bulbs, we noticed that all LED bulbs that existed on the market were generally pretty mediocre. Their lighting properties were mostly the same, and the manufacturers weren’t really interested in making them health-friendly. Personal lighting was strictly utilitarian, while it could be so much more. We realized we had great potential to change the lighting industry, and it reshaped our outlook on what we do, as well as why and for whom we do it. It was a big step from standard light sources to human-centric, personalized lighting, and we’re proud we made it. 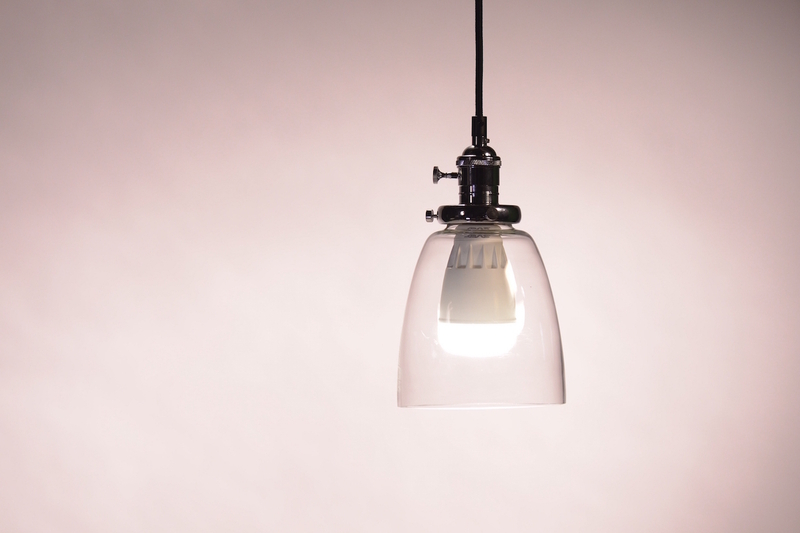 We believe that lighting should be created with comfort and health in mind, not just energy efficiency. We are determined to change the world with health-focused and personalised lighting. All in all, it’s been three years since we’ve started to research and develop SVET bulbs from scratch. And so far we’ve been able to bring our vision of health-centric personal lighting to successful working prototypes. But we can’t take the next big step without your help. We would like to give you SVET light bulbs at a really affordable price in order to do so our production and supplier infrastructure requires certain minimum quantities of ordered units. Each contribution helps us with the production of the first batches of bulbs (in terms of units), which we will be able to use as a stepping stone for future production. With you, we will be able to reach our initial goal and contribute together to a healthier future for everyone. We've given a conservative estimate for our delivery dates in the perk descriptions. We are committed to keeping you informed of our progress both during and after our campaign. Rest assured that we are working very hard not only to produce a sensational product of prime quality, but to ensure it reaches you without delays. If you have and questions during or after the campaign, you can always reach us at info@svet.io We receive a lot of special requests, and respond as fast as possible. 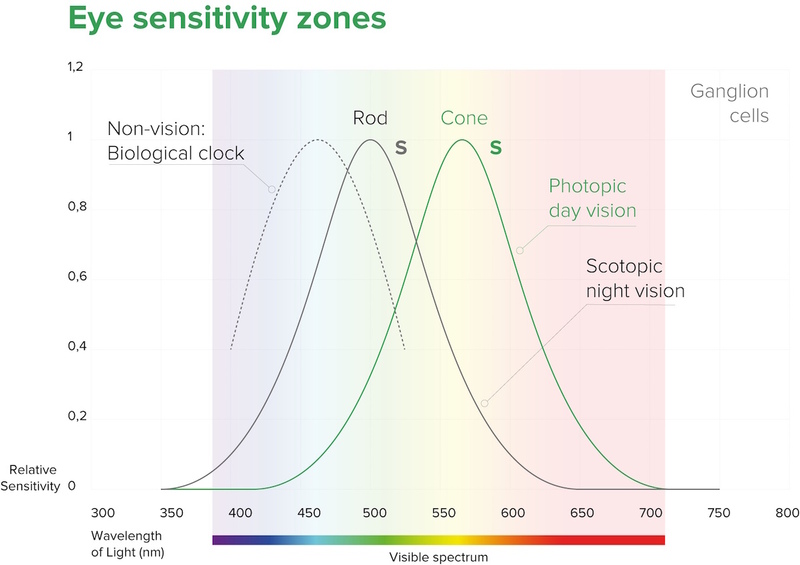 What is the benefit of full-spectrum light? First of all, it is safe for the eyes. The full-spectrum lighting of SVET allows you to see the colors of your surroundings with minimal distortions. This is very important for our vision and well-being, as natural colors are more comfortable for the eyes. Would this have the same effect as a sun lamp used to aid in SAD (seasonal affective disorder)? SVET helps to prevent SAD as it repeats natural dynamics of the light to improve your biological rhythm. It means, among other things, that you get more blue light in the morning to energize you for the rest of the day. Blue light suppresses melatonin. Melatonin is a hormone naturally produced by the body at night when it is dark. It is necessary for a proper sleep, but it is also a powerful antioxidant and has many beneficial health effects. That means the more light we are exposed to as we get ready for bed, the harder it will be to fall asleep and get a good night’s rest. Any immediate shifts from bright light to darkness can also make it harder to fall asleep. How can light help me wake up easier? Waking up with first sunlight is not just due to irritation from light rays. We perceive light through closed eyes in our sleep, and the specific properties of dawn light serve as triggers for the body to prepare us for wake up. While we are still sleeping, the nervous system wakes up internal organs and increases brain activity by degrees. The final moments up to waking up occurs when the whole body is prepared and is completely stressless with the right lighting. Is it similar to 'wake-up' lights available on the market? SVET is a dynamic lighting solution – it’s not just for wakeups. SVET is designed to support you during the day when you are at home or in the office. Based on your biological rhythm, SVET helps you to be alert in the first part of the day and relaxed in the evening if you need it. All lighting scenarios change dynamically based on your individual preferences. Does SVET work with a sleep cycle app? How does light influence my productivity? A number of studies have shown that exposure to blue-heavy lighting promotes alertness, increases energy and enhances overall performance. Basically, a light with an increased blue light spectrum helps concentrate better, which is a desirable effect for a work environment. At the same time, a light completely devoid of blue, or at least with a much lower amount of it, may be used to achieve better results when we do not need alertness and increased energy. Having the ability to tune lighting at will gives you more control over your productivity and recreation. Is it possible to boost productivity with light? Yes, we achieve better results and make fewer mistakes when the lighting environment is suitable for our activity. Different setups of lighting can be used to stimulate concentration, provide a relaxing atmosphere, and otherwise affect performance or mental state. What are the detailed SVET specs? If LEDs do not have flicker, where does this flicker come from? LEDs themselves do not have flicker. But LED light bulbs can have flicker because they use LED drivers, which convert AC to DC. SVET uses analog dimming to avoid flickering when changing the brightness. Does SVET keep luminosity the same if you change the color temperature? Luminosity decreases about 10% at low color temperatures like 2000K. Is SVET suitable for outdoor use? No. 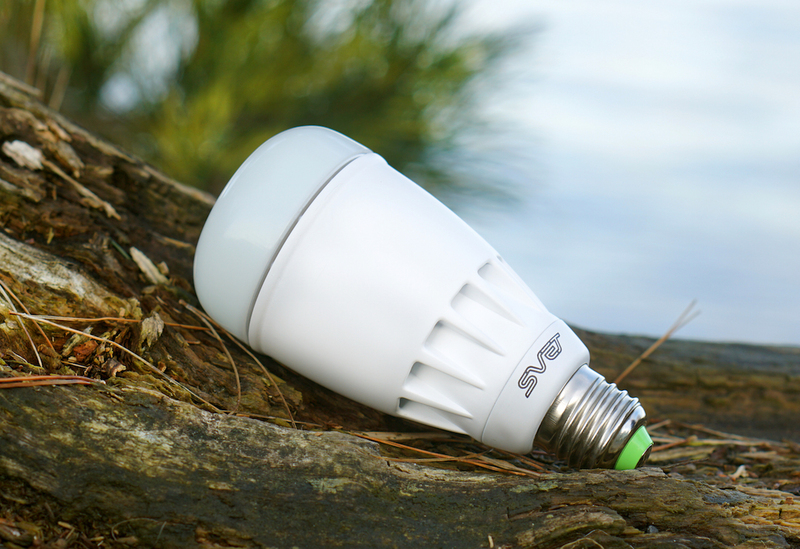 SVET light bulbs have not been designed for outdoor use. Using SVET light bulbs outdoors may void the warranty. 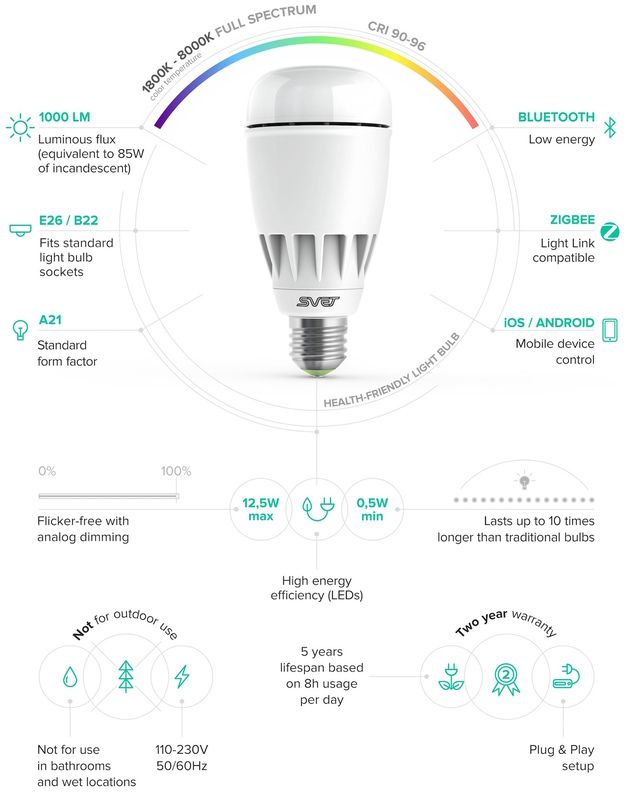 Can SVET light bulbs be used outside the US? Yes. 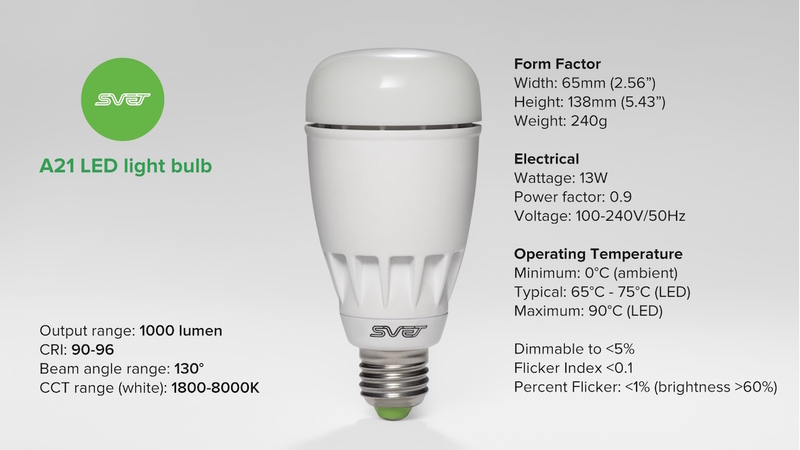 SVET light bulbs have a universal power supply – 110-230V 50/60Hz. Can I use SVET light bulbs with a dimmer? Most dimmers are not designed to operate with LED light bulbs. 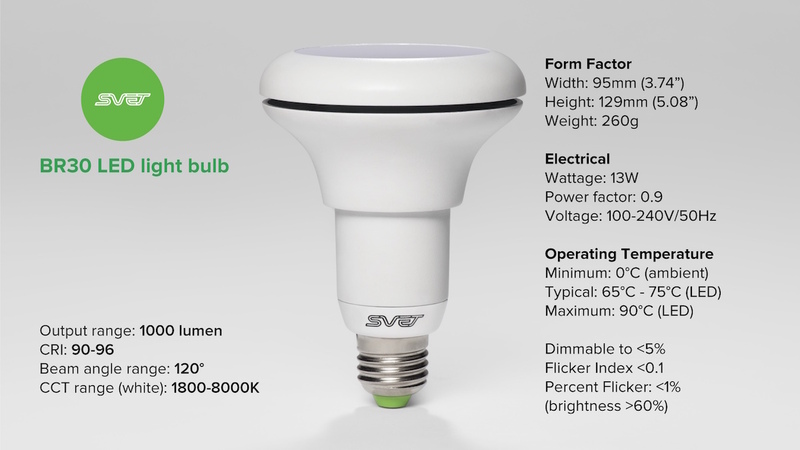 SVET is a LED light bulb and requires 100% power to operate. Please use the SVET app to dim the light. How does SVET help save energy and ecology? SVET LED bulbs use significantly less energy than incandescent light bulbs. They do not contain mercury or lead, and can be recycled in the same way as any other electronic device. No precautions are needed if they break. SVET lighting saves up to 90% more energy compared to traditional lighting sources. What about 2b radiation and the EMF (the electric and magnetic fields)? LED light bulbs use 10 times less power than usual light bulbs, which means 10 times less electrical and magnetic waves. 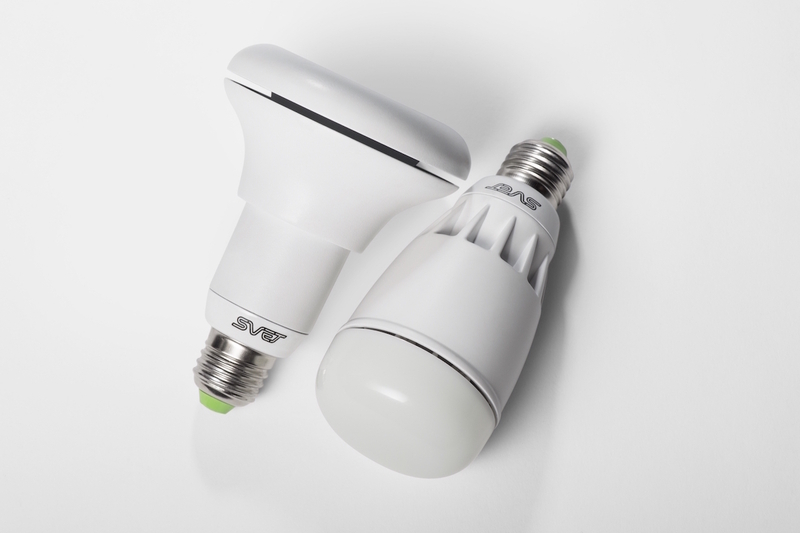 SVET light bulbs use ZigBee and Bluetooth LE (all low-power) wireless protocols. These radio frequency transmissions operate at minuscule power levels even compared to WiFi and Cell phones. On top of that, most of the time the transmitters remain in “sleep mode” – listening, but not transmitting (and thus not emitting any danger radiation). What's the difference between SVET and other similar lighting solutions? The main difference is in the quality of light and its dynamics. 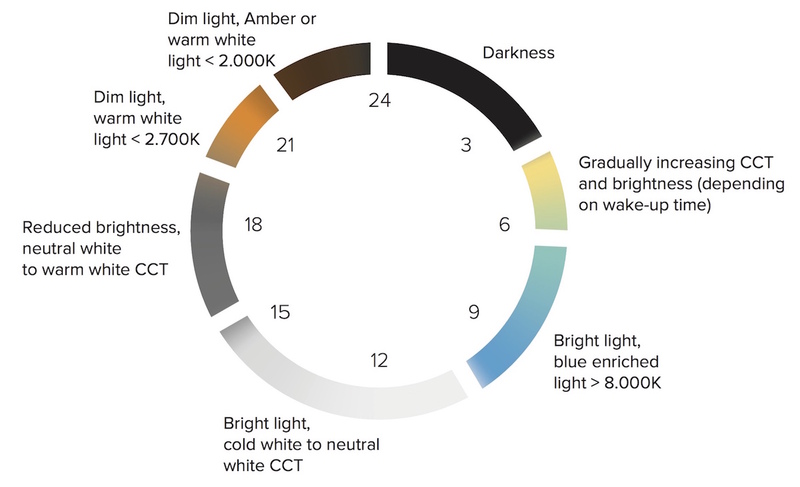 SVET light bulbs have rich spectrum, which mimics daylight dynamics during the day based on your wake-up and bed time automatically. Additionally, SVET is flicker-free, which is comfortable for the eyes, and has a high CRI of 90-96. The most important unique feature of SVET is the biological safety. It ensures that the lighting chosen manually will not harm your biological rhythm. Can you change the light color of SVET light bulbs? Yes, SVET light bulbs are able to change light color, from deep red to deep blue. Is SVET good for a reef aquarium? SVET is not designed to be used in reef aquariums. Reef aquarium lighting requires UV part of the spectrum, which is not safe to use in residential lighting. Is it good for parrots / exotic birds? 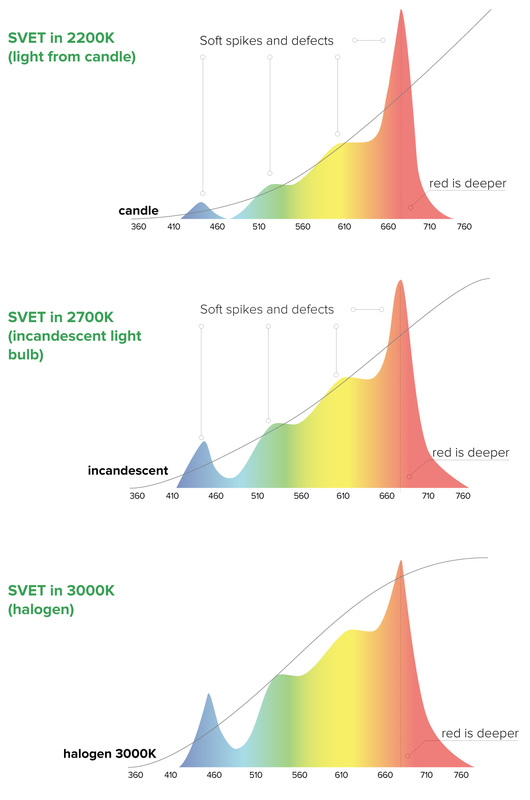 SVET light bulbs do not emit UV or IR part of the spectrum. So, it is safe for them but exotic birds need the UV part of the spectrum. When will SVET be shipped to the backers? 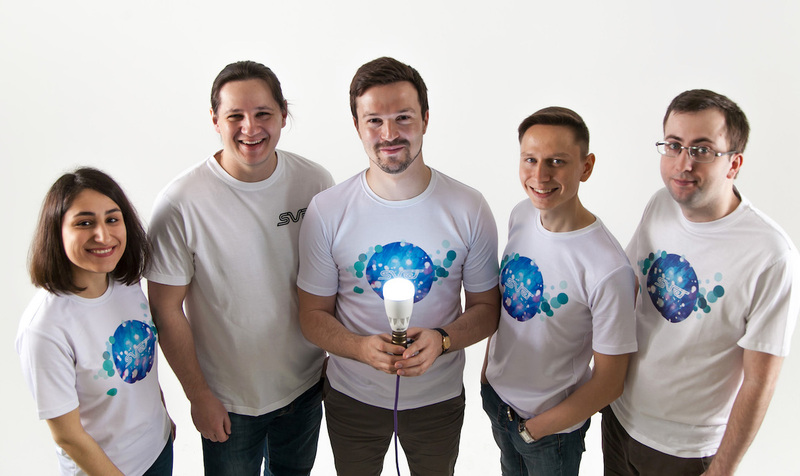 We plan to ship SVET light bulbs in early 2017. US orders will be shipped first, and all international orders right after. Please help us become a new standard in lighting by spreading the word, dear family, and friends. Share this campaign link on your Social Media feeds. Thank you for your support!